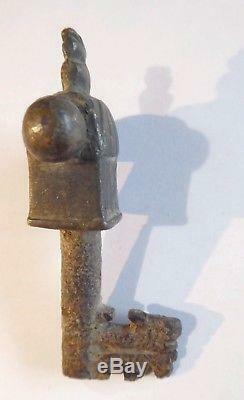 Roman key with rotation, 2nd century, bronze head, 7cm. If you are looking for quality objects: type. 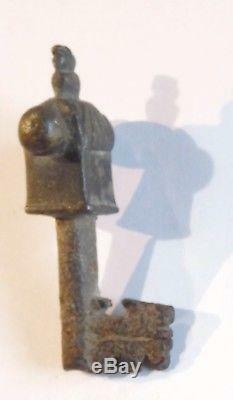 Small piece of museum: small bronze-tipped wrench with sand and engraved, forming a subject that could be an altar or burns the fire of victory? Hollow iron rod with open blade. A key of the same dimensions, same structure in the museum secq, reproduced in the documentations, see last photo. Dimensions = 7cm and 3.5cm. Provenance: a collector of our region, south of France. Our guarantee commits us in the following way: we are not experts, but we refund 100%, without questions and with our excuses, any person disappointed by our sending, in the reasonable time of 15 days. No risk for our customers! The sending of this object 10 for France, and 20 for Europe. Type eclecticnimes on google, hundred of objects. 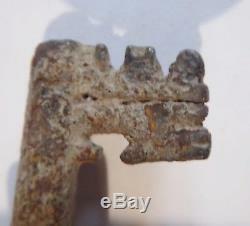 Roman key, rotation, second century, bronze head, 7cm, 328611 small piece of museum: small bronze-tipped, engraved, bronze wrench, forming a subject that could be an altar where burn the fire of victory? (simple hypothesis) hollow iron rod with open perthuis a key of the same dimensions, same structure in the secq museum, reproduced in the documentations, see last photo. Dimensions = 7cm and 3.5cm. Provenance: A collector of our region, Nîmes, Roman city. The item "Roman key rotation, 2nd century, bronze head, 7cm" is on sale since Sunday, February 25, 2018. It is in the category "art, antiquities \ objects of the nineteenth and before". The seller is "dany46" and is located in bellegarde, in camargue. This item can be delivered anywhere in the world.